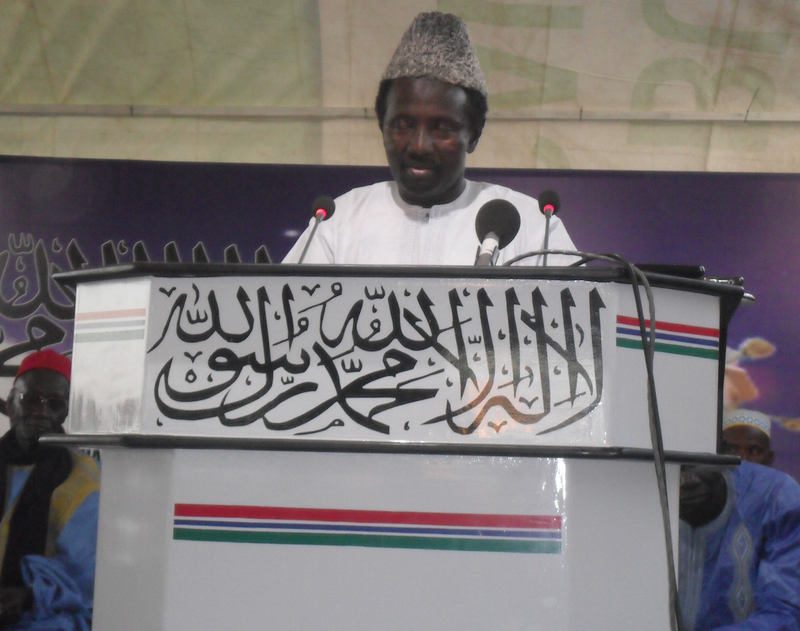 The Ahmadiyya Muslim Jama’at The Gambia on Saturday 12th April 2014 successfully concluded its 38th National Jalsa Salana (Annual Convention). The Jalsa, held at Masroor Senior Secondary School in Old Yundum, opened on Friday 11th April, 2014. 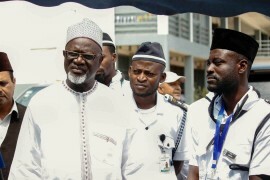 In his opening address, the Amir of the Ahmadiyya Muslim Jama’at The Gambia emphasised on the peaceful nature of Islam and urged participants to use the days of convention (Jalsa Salana) to attain higher spiritual status. Amir Sahib Baba F Trawally also highlighted on the exalted status of the Holy Qur’an and essence of reciting it. “I welcome you all to this noble and spiritual gathering and pray that every word in this gathering will be of spiritual enlightenment and development to all guests and participants. This gathering has only one objective and that is achieving the love and pleasure of Allah Almighty. Therefore, every moment of the Jalsa should be spent in the remembrance of Allah Almighty and sending down blessings on His beloved, the best of humanity, Holy Prophet Muhammad Mustafa (saw). “Let it be remembered that the blessings and effects of the Holy Qur’an were not limited to the age in which it was revealed; it is meant to bring about the same changes in every age that follows. The world is passing through very difficult times, especially the Muslim world, because of indifference to this Noble Book. A heart deprived of the Holy Qur’an is a desolate one in which anything evil can grow and flourish. Why should the Muslim Ummah be in so much turmoil while still in the possession of the cure of all illnesses—the Holy Qur’an? This does not detract anything from the efficacy of this Holy Book but it shows that those who possess the Book do not give it the due regard. His Holiness, Hadhrat Promised Messiah and Imam Mahdi (peace be upon him), Founder of the Ahmadiyya Muslim Jama’at said that the chief purpose of a Book of God and a Messenger of God is to rescue the world from a life of sin and to establish a holy relationship between God and the world. The Muslim world should therefore turn to this Holy Book so that their troubles would become history. Learn the Holy Qur’an, practice it and teach it to others. The Holy Prophet Muhammad Mustafa (saw) said that the best person is he or she who learns the Holy Qur’an and teaches it to others. Only those who honour the Holy Book shall be honoured in heaven. He further said that every single commandment of the Holy Qur’an should be obeyed and disobedience to any of its seven hundred commandments spells the doom of an individual. The heart should be a throne of the Holy Qur’an,” he said. 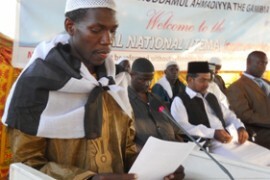 In his address at the women section, Amir Trawally stressed on the importance of observing the teachings of Islam and instructions of the Holy Qur’an. “Women are nation builders; no society can prosper without righteous women. The Holy Qur’an describes righteous women as those who are obedient and guard the secrets of their husbands. The upbringing of children is the joint responsibility of both parents. The righteous upbringing of children is impossible without an environment of love, affection, trust and kindness. We should tolerate each other and show children the best examples,” he told the women participants. “The status of women in Islam is very high. In fact, it was a woman (Hadhrat Khaddija (RA)) who was the first to accept Islam, comfort the Holy Prophet Muhammad Mustafa (saw) and gave all her belongings for the furtherance and propagation of Islam. Islam makes no distinction between the spirituality of men and women; all are rewarded accordingly. Allah the Almighty says that believing men and women who live a righteous life are equally granted forgiveness and great reward. The Holy Prophet Muhammad Mustafa (saw) has even said that Paradise lies under the feet of the mothers,” he said. In his concluding address at closing session of the convention, Amir Trawally reminded all participants to remain devoted to Allah the Almighty. He said that Allah, the Almighty should be the object of everyone’s worship; fear, love and hope should be for God alone. He also told the participants that no action that is detrimental to the well being of society should be committed by a Muslim. Amir Sahib used to occasion to extend salam and special prayers of Hadhrat Khalifatul Masih V, Hadhrat Mirza Masroor Ahmad (aba), Supreme and Spiritual head of the Worldwide Ahmadiyya Muslim Jama’at. He also requested prayer for Hadhrat Khalifatul Masih V (aba) and our beloved and dear motherland, The Gambia. “Nurture and nourish love and obedience for the institution of Khilafat and instil the same in the younger generation. 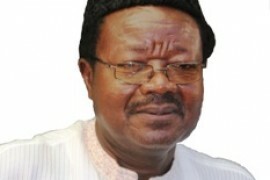 Pray for our dear country the Gambia and the sub-region, the Arab world and humanity at large,” he advised.